Yesterday finally saw the completion of the long-anticipated SABMiller takeover by Anheuser-Busch InBev (NYSE: BUD). With a final transaction value of around $105 billion it immediately becomes the largest ever takeover of a British listed company and third overall globally. At some point in the next few days SABMiller shareholders will receive either £45 in cash per-ordinary share, or a partial share offer of 0.483969 restricted shares for each SABMiller share plus £4.6588 per-share in cash. The latter offer being necessary to get SABMiller’s two largest shareholders – Altria and the Santo Domingo family – onboard without triggering the huge tax liabilities on their capital gains if they were to receive an all cash deal. If you were a former SABMiller shareholder with a long-term outlook and a significant enough holding you’d probably be more than happy to sit back and enjoy the advantages of the second offer. You immediately get £4.6588 per-share in cash and your NewCo shares will still be churning out cash dividends despite the fact that you would be restricted from selling them for five years. You also get the added bonus that the second option basically values the deal at £54 per-share compared to £45 for the all cash offer. Given that the new company shares start trading today then now seems like a good time to take a look at the enlarged new company. If you had to describe it in one word it would be a toss up between scale and monster. Just look at some of the names it overtakes in terms of sales and earnings. 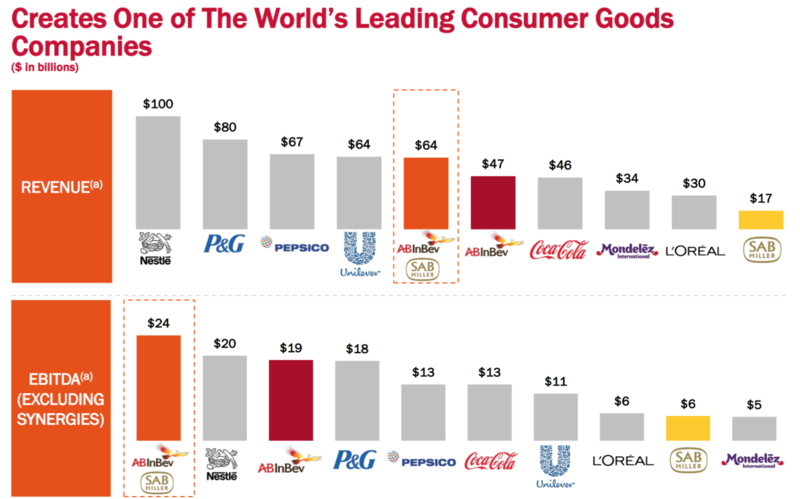 Its $60 billion in projected annual revenues puts it on the same scale as Unilever and above the likes of Coca-Cola, Mondelez International and French beauty giant L’Oréal. At $24 billion it will rake in the equivalent EBITDA of Coca-Cola and Unilever combined, and 20% more than Swiss food behemoth Nestlé. Its brands will be responsible for about a third of all global beer consumption and nearly half of the industry’s profits. The situation with the beer industry is that the market is pretty much completely saturated. The only market you could really call growth in the beer world is Africa (where Anheuser-Busch InBev had little presence pre-merger). In general terms that means organic growth prospects are pretty weak. Indeed if you were to take a look at the performances of the big beer stocks such as Anheuser-Busch InBev, SABMiller, Heineken, Carlsberg and Molson Coors then you’ll see the same trend of low revenue growth over the last five years or so. In order to make this kind of mega deal work you’re therefore going to be relying heavily on cost savings and synergies. So far the company have announced that about 5,000 jobs will be cut following the merger – equivalent to about 3% of the total workforce. I guess it’s a pretty brutal form of capitalism in the pursuit of shareholder returns but it’s the way these type of transactions are going these days. The exact same thing happened when Kraft/Mondelez took out Cadbury and when Kraft and Heinz announced their merger under the direction of 3G Capital (the masters of cost cutting) and Berkshire Hathaway. When Heinz was first taken out in 2013 by Berkshire and 3G there were about 7,000 job cuts. In the case of the Kraft/Heinz merger I think you saw something something like 5,000 job losses alongside factory closures and commitments to invest heavily in their remaining facilities. With Cadbury hundreds of jobs were lost in the United Kingdom and a chunk of production moved out to cheaper countries. That’s the deal with some of these saturated consumer product industries where you aren’t going to get a lot of growth through increasing sales volumes. Where you can get it from though is by increasing productivity (e.g. getting a robot to do a human’s job), exploiting synergies and through things like price increases. Indeed with Anheuser-Busch InBev a decent chunk of their earnings growth has come from margin expansion over the past decade rather than directly from the top line. The same thing applies here to them taking over SABMiller. After a one-off charge of about $1 billion the company has projected that it can realize about $1.4 billion in annual savings as a result of the merger, and analysts think that figure may stretch to as much as $3 billion. Most of that will come from closing down and merging offices that overlap on a geographical basis plus things like productivity gains and increased logistical efficiencies. Taking the combined profits of the new company into account plus some synergies you’re looking at $12 billion in annual net income – equivalent to $6.00 per-share. Against a current share price of $128 that represents a forward P/E ratio of about 21x estimated earnings. As it stands the current Anheuser-Busch InBev dividend is $3.95 per-share; so on the face of it the distribution should be covered by the earnings of the combined company. The final point I’d make is regarding on NewCo’s balance sheet. In short it’s going to have a heck of a lot of debt on it as a result of the deal (over $100 billion worth to be precise). At 4.5x projected EBITDA and a dividend pay-out ratio of 66% there isn’t an awful lot of room for maneuver there. Either the dividend will get cut, freeing up cash to strengthen the balance sheet and reduce annual interest charges, or at the very least the dividend growth outlook will be pretty low in the near future. Either way it isn’t exactly screaming value right now. I mean you can currently pick up Johnson & Johnson stock for 17x forward earnings and a 2.75% dividend with better growth prospects and a much healthier balance sheet. But if we’re talking about a long-term portfolio of the highest quality businesses out there then Anheuser-Busch InBev stock would definitely deserve a place. It’s the undisputed king of beer profits.